This product is based on the latest research results of kinematologists. 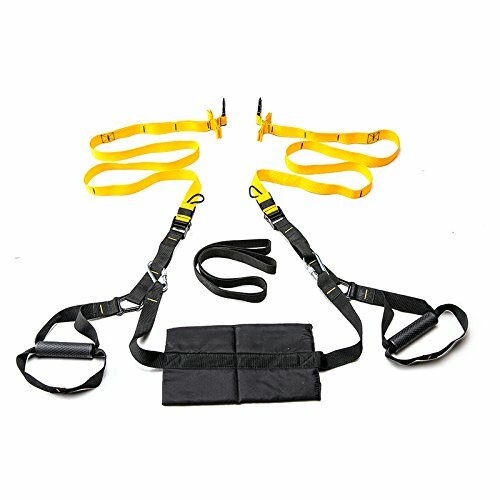 First of all, it is a fitness belt with two hanging points connected to the wall or roof by two hanging points, so trainers do not have to fight against instability at every angle. Make training more stable, so that more people, especially beginners can practice more actions, and reduce the harm the training to the body. Second, the more humane design, the door anchor on the top of the fitness belt, in order to improve the quality of training, the new design adds a new training facility - pedal. The mix of sports is more diverse, colorful and the body gets better practice, which makes it stronger and healthier. This system provides everything you need to build strength, increase your flexibility, spot-train, use this complete bodyweight trainere workout system at home, in the office, or while traveling-it's so easy tobring with you! This is great if you travel often since this doesn't take up a lot of room and you can use it anywhere that a door is available, and as everyone knows every room in a hotel has a door)and fit in a comprehensive, healthy workout anytime you want, anywhere you want. your basement or rec room; our kit can work all the major muscle groups. Arms, legs, core. The core gets a beating in most of the arm & leg exercises, too. Attach the straps to a door with theincluded attachment system or secure them to different anchor points such astrees, bars, playground equipment,outdoor or even tree. It's an excellent tool for core training, balance, general strength,... If you're a not used to train with unstable equipments ask for guidance of an expert (personal trainer) to avoid injuries . New design, brand new products. EASY TO CARRY: The Weight of our kit is 3.2 lb.You can set it up virtually anywhere in less than a minute. Work out anywhere on your own schedule. FULL-BODY TRAINING KIT: This training kit is designed to not only develop the lumbar and back muscles, but also improve the body balance ability. This full body resistance exercise kit is exactly what you looking for. GOAL：Developing core stability and power,anywhere you want,help you achieve a better version of yourself is our goal. If you have any questions about this product by HAYU, contact us by completing and submitting the form below. If you are looking for a specif part number, please include it with your message.